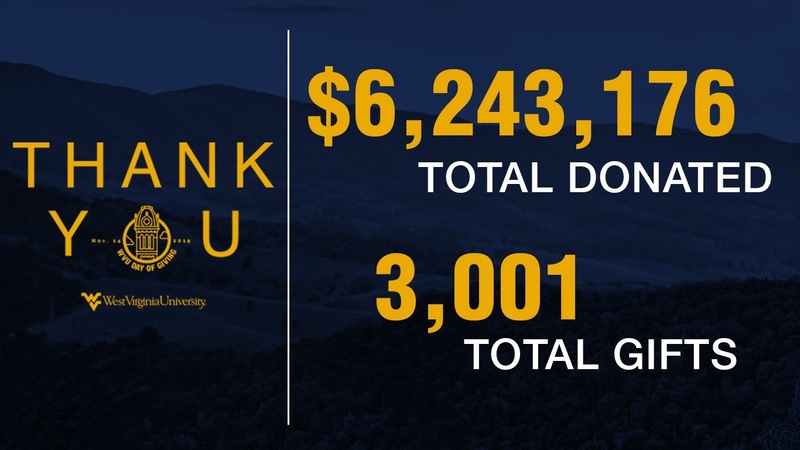 Supporters of West Virginia University donated more than $6 million Wednesday (Nov. 14) during the University’s second annual Day of Giving, more than doubling last year’s total. It was promoted as “One Day to Give Back” and donors responded making 3,001 gifts during the 24-hour online giving event totaling over $6.2 million. The Day of Giving’s success was buoyed by several global matches and participation gifts, as well as those made at the college/school/unit level. Those included the first $50,000 raised during Day of Giving being matched dollar-for-dollar, and the first 1,000 gifts of $100 or more being matched up to $100 each for an extra $100,000. Donations made to any Greatest Needs Fund on Day of Giving were matched dollar-for-dollar by Frank and Jayna Alderman for an additional $25,000. Also, Pat and Alison Deem generously matched donations made to general scholarship funds on Day of Giving for another $25,000. In a participation challenge, Mountaineer Nation responded by sharing more than 2,000 photos on social media with the Mountaineer Mascot (current or former). That unlocked a $20,000 gift from alumni Mike Escue and Alexis Pugh. WVU Day of Giving was focused on raising private dollars for the University’s greatest priorities and opportunities, including scholarships and unrestricted funds at both the University and unit specific level. The event also included WVU Health Sciences and the regional campuses in Keyser and Beckley. During the inaugural WVU Day of Giving last November, more than 2,500 gifts were made totaling nearly $3 million.